WELL over 100 children created their own decorations in Bognor Regis. 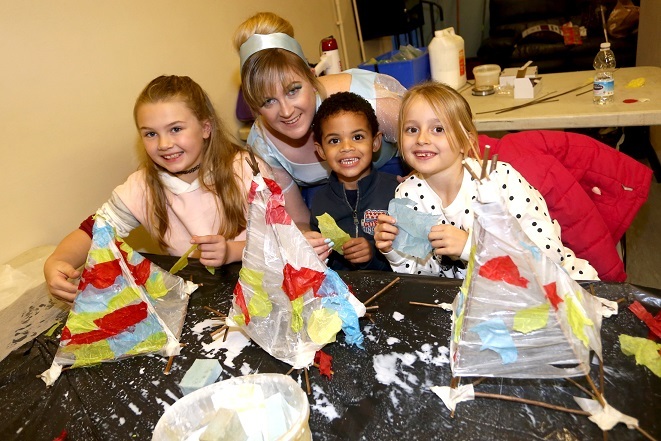 The packed turnout ensured the willow lantern workshop held by the town council as part of its Christmas celebrations was packed. The event’s success saw one of the Regis Centre’s studios full throughout last Saturday with seasonal creativity. One of the children who took part was India Rose, six, of Westergate. She said: “I enjoyed making my lantern. I liked sticking the frame together and the part where I had to put the cross bit on the bottom of the lantern. I have never made one before and I think it looks good. The workshop was run by artist Sharon Potter, pictured far right. She said: “Today’s been very popular. It’s about showing children what they can make and enabling them to gain confidence.